Welcome back to our second monthly Downeast Medal Finals Newsletter! This year, our finals will be held from September 15-18th, 2016 at the beautiful Skowhegan Fairgrounds, Skowhegan, Maine. Visit our website for more information. The first impression we give to others is crucial in many areas of our lives, but perhaps none more important than in showing horses. As judges, our job is to choose the best, whether that be the horse or the rider. Our priority, of course, is to score based on the performance of each exhibitor, but as is quite common in novice or amateur over fences classes, all entries will have some small mistakes on course. These could include slightly long or deep distances, late lead changes, swapping leads off the ground, or an incorrect or inconsistent pace. In addition to our responsibility to place the class correctly, we also must do so quickly. This is why the first impression that you give to the judge is so important. When judging, I always record my overall impression of each exhibitor into one of three categories: above average, average, or below average. In an over fences class I will generally make this determination in the opening circle; in a flat class, I will most often make it in the first direction at the first gait I ask for, most often the trot. There are many important criteria to be met to record an above average overall impression on my judge's card, and none more important than proper turnout. This includes cleanliness of horse and rider, and properly fitting and correct equipment and clothing. It is also very important for each exhibitor to be entered in a class appropriate to their ability, and also to be exhibiting a horse that is suitable to the rider's size and experience. If all of these criteria are met, the exhibitor who has given me an above average first impression will be placed above their competitors who have similar small mistakes in their performance. Again, as judges we want the best horse or rider to win. We teach correct horsemanship by how we place a class. It is very important as an exhibitor to notice, and subsequently to demonstrate, the criteria that lead to a favorable or above average first impression to the judge. It is an area where everybody can succeed by simply putting in the hours caring for their carefully chosen horse and by entering a suitable division. You may have seen Linda around the show circuit in the past. Linda has been showing her own horses since the 1980’s, from Maine to Virginia. Linda managed the NNEHJA (Northern New England Hunter Jumper Association) horse shows in the late 1990’s into the early 2000’s, originally running a series throughout the year. In the 2000’s, she ran a Classic horse show, with 2 rings, catering to all levels of hunters from lead line to upper level equitation and jumpers.She has since retired to the secretary’s booth and the hunt field, hunting with Wentworth Hunt Wednesdays and Saturdays, both spring and fall seasons. 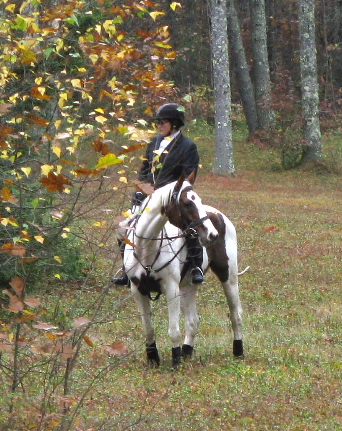 Linda travels to Aiken, SC, and Southern Pines, NC, in the off season to catch a ride during those winter months. 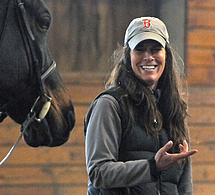 She is still very much in the saddle, schooling both her horses while working at Liberty Mutual. Linda is very excited to be a part of the DMF show this year. Feel free to stop by and say hello, Linda is always willing to help anyone, from the first time horse show parent to the seasoned rider. Kristen Mugnai has been riding for almost 50 years, but took a long break from competing between the ages of 16 and 40. When she found herself missing competition, she decided to try jumping with her mustang Missy. Missy had done mostly western and trail but seemed to have a knack for jumping. Kristen started competing in the jumpers, adult equitation, and even hunters at the local shows. As Missy was mostly suited for the jumpers, Kristen competed on a rescued Irish Draft named Freedom. The past few years, Kristen has shared horses with kids who wanted to go to Downeast Medal Finals and she has competed in the adult medal. Ultimately, she would love to have her own horse to compete on again in the hunters and adult equitation. Missy, at 26 years old, is still going strong and consistently winning jumper classes below 2’6”. 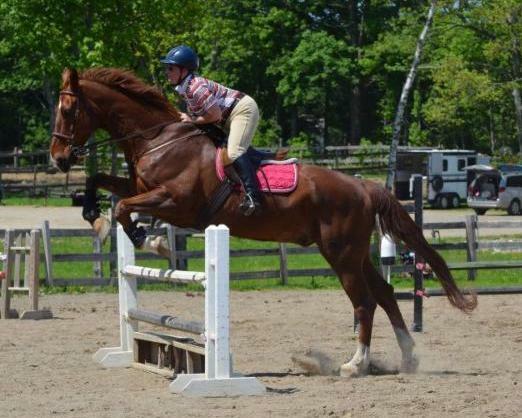 Kristen’s daughter is currently working with a new green hunter mare who Kristen is looking forward to showing when her daughter goes off to college. Amateur Adults Take Notice: In previous rules, the champion of each division at the finals is no longer eligible to compete in that division in subsequent years, while that rider is eligible to compete in other divisions, if otherwise qualified. There is no longer a restriction for the Amateur Adult Medal Final! Previous Downeast Medal Finals Amateur Adult Champions are welcome to qualify and compete in the Downeast Amateur Adult Medal Final even if they have won previously.